This appealing little skipper extended its range south into Massachusetts within the last century, but since 2000 seems to be retracting northward again, possibly because of climate warming. It is a boreal (not an arctic) habitat specialist, but surprisingly was found many parts of Massachusetts in the 1990's. It is holarctic, and is declining or threatened in Great Britain and Japan, though seemingly stable in North America (Asher et al. 2001; Cech 2005). Samuel Scudder and W. H. Edwards called this the “Mandan” skipper (Pamphila mandan), after a Native American group along the Missouri River. Scudder wrote “It occurs also, in New England, being not uncommon in the higher valleys of the White Mountains, as along the Glen road and along the roads into the ravines and through the notches in the vicinity of Crawford’s and of Fabyan’s....” (1889:1572). Scudder’s only New England specimens and reports came from New Hampshire and Maine; most were from Canada, and he had no specimens or reports from Massachusetts. Harris did not have this species in his 1820-1852 collection ( Index). Maynard (1886) had “never met with this skipper living,” and thought it was rare. There are no early Massachusetts records in the Harvard MCZ, or other museum collections. The first state record seems to be from the northern town of Phillipston in the early 1930's, taken by H. H. Shepard, who referred to it as “my best capture” (Farquhar 1934; specimen location unknown). Scudder’s 19th century reports had set the southern limit of this species as northern New Hampshire and Maine. By the 1970’s evidence had begun accumulating that the skipper was increasing in Massachusetts (Table 2). In 1965 C. G. Oliver reported Arctic Skipper from the Acton area, adding that it was easy to find in late May. In 1971 Edward M. Peters reported a specimen from Sudbury, and in 1972 one from the vicinity of Carlisle, and he remarked that this was the first time this species had been seen in Carlisle (Lep. Soc Seas Sum. Corresp.). In 1973 there were three reports: Dave Winter captured two in Dunstable near the New Hampshire border on June 9 (specimens in the Harvard MCZ), J. Ingraham found one in Dover on July 1, and T. Franks found one in Wellesley on June 6. Winter wrote that “the latter two records seem unusual for this northern species,” but he reported them in the Lepidopterists’ Society Season Summary as a “good range extension” (Lep. Soc. Seas. Sum. Corresp. 1959-1976). The 1986-90 MAS Atlas found Arctic Skipper as far southeast as Milford, Sherborn and Northborough, and as far east as Acton and Concord (Middlesex Co.) in Massachusetts. The 1995-99 Connecticut Atlas had only one 1940 record from all the pre-project years (1896-1994) in that state, but amassed six records during the project period. 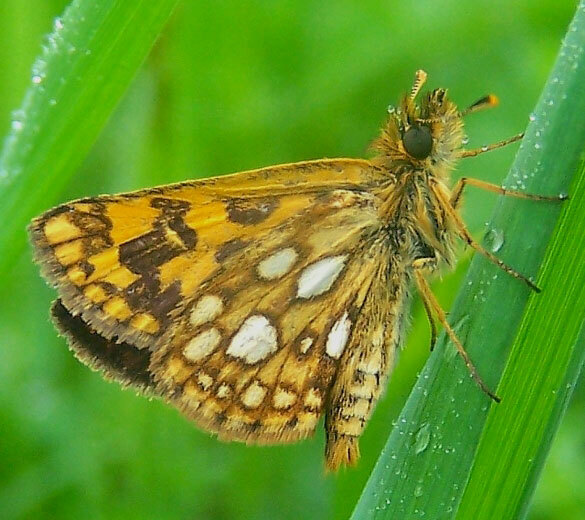 Other Connecticut butterfly observers in the project period reported additional sightings of Arctic Skipper around Union and in Litchfield. The greater number of Connecticut Atlas project records compared to pre-project remained unexplained in the final write-up, but was attributed mainly to greater effort rather than range expansion. But looked at in a larger time frame and in regional context, it seems obvious that a southward range expansion since Scudder’s time did in fact take place. Arctic Skipper is not limited to boreal habitats, but ranges from sub-arctic tundra in the north to transitional forest areas to the south. It is found today in Massachusetts in small colonies “in well lit grassy areas near wooded habitats; typical locations include grass-lined forest paths and glades” (Walton, 1986-90 Atlas). Rangewide, its habitats are wet meadows, wetland edges, and moist valleys (Scott 1986; Layberry 1998; Cech 2005; O’Donnell et al. 2007). In Massachusetts it is often found nectaring on early-blooming wild geranium (Geranium maculatum), a common wildflower native to all counties here. The specific host grasses in Massachusetts are still unknown, but Calamagrostis, Bromus and Panicum species are used elsewhere (Scott 1986; Scudder 1889:1573). Calamagrostis canadensis, a native wet meadow grass which is common throughout New England and found in every county in Massachusetts (Cullina et al. 2011), is a possible host here. Like several other skipper species, Arctic Skipper females will oviposit on Kentucky bluegrass (Poa pratensis) in the lab, and larvae will grow to maturity on it, as demonstrated recently during the Connecticut Atlas project (O’Donnell et al. 2007; Scudder 1889:1572). Use of this grass in the wild might account for the Arctic’s relatively robust presence in Massachusetts. Both the 1986-90 MAS Atlas and 2000-2007 MBC records rank Arctic Skipper on the lower end of “Uncommon” in the state (Table 5), placing it on a par with such species as Pepper and Salt Skipper, Meadow Fritillary, Hoary Edge, and West Virginia White in terms of frequency of sightings. It was not Rare in these years. The trend in unadjusted MBC sightings was strongly upward between 1992 and 2009 (Chart 85), primarily because of increased visitation and counting effort at the species' main stronghold in the state, Moran WMA in Windsor (Berkshire Co.). No population trend should be deduced from Chart 85, because the numbers depend so much on whether any visit was made to Moran WMA, and how much counting effort was expended there. But a possible increase in relative abundance 1992-2009, and decline 2010-2013, is suggested when numbers reported are adjusted by total trip reports (chart not shown). And in 2007, 2008, and 2009 the average number of Arctic Skippers per report of that species increased 100, 200, and 300% in comparison to the preceding years back to 1994 (Nielsen, 2008, 2009, 2010). However, list-length analysis of 1992-2010 MBC records showed a statistically significant 53.4% decline for this species (Breed et al. 2012), a result which does not accord with the upward trend of numbers reported per total trip reports. The yearly high counts from Moran WMA in Windsor shown in Table 1 largely determine the statewide pattern seen in Chart 85, because there are few other known large sites. Numbers of observers, time in the field, and route taken at the Moran WMA site all have varied enormously year to year. More systematic scientific monitoring of this critical site is recommended. BOM-MBC 1992-2013 records (Map 85) show Arctic Skipper present in central and northern Berkshire County, in central and northern Worcester County, in parts of Middlesex County and in Essex County. It was absent from the entire southeastern coastal plain, the Cape and the islands, and most of the Connecticut River valley. There were Arctic Skipper records from 35 of a possible 351 towns over these 22 years. The majority of reports from the south-central and eastern locations are of singles only, indicating a thinly-spread population of Artic Skipper in these areas. More important, the great majority of reports from these central and eastern locations are from the late 1990's, and have not been re-confirmed since, even though many of the locations were well-visited. Table 2. Reports from Well-Visited Sites, East and Central Mass. The last report from Concord was 1995, from Chelmsford power line was 1998, from the Central Franklin NABA Count was 1992, from Princeton Wachusett Meadow WS was 1998, from North Andover Weir Hill was 2001, and from Worcester Broad Meadow Brook WS was 2001. The two southern-most reports on Map 85 are Upton (1, 6/4/2000, gas line, T. and C. Dodd) and Foxboro (1, 6/7/2007, Lamson Rd., M. Champagne). These are the only reports from these sites, and there have been no subsequent reports through 2013. The species did reach this far southeast during the 1986-90 Atlas period; the southernmost towns in the Atlas database are Milford and Sherborn. The eastern-most sightings are those from Topsfield, Groveland and North Andover in Essex County; none are more recent than 2001. The Atlas had also found it in North Andover and Reading, in 1988. There are no BOM-MBC reports in this period from southern Berkshire County, even though the Sheffield area is often visited. But in the 1980's the Atlas found Arctic Skipper in the towns of Mount Washington, Otis and Tolland, and West Stockbridge and Becket. More searches during flight time need to be made in these areas. The Atlas did not find Arctic Skipper in the central region centered around Quabbin Reservoir---instead there seemed to be a gap between Berkshire County and the Worcester area. BOM-MBC records show a similar gap, but also add many new sighting locations in the central part of the state, including Hubbardston/Rutland (Barre Falls SP), Orange (Tully Meadow), Paxton (Moore SP, 1, 6/5/2007, E. Barry), Worcester (BMB), Upton, Petersham, Ashburnham, and Stow (Delaney SP). The most well-known and productive location for Arctic Skipper has been Moran WMA in Windsor (see table above). The only other specific locations reporting significant numbers are Lee/Washington October Mountain SF, 10 on 6/5/1999, M. Lynch and S. Carroll; Adams Greylock Glen, 7 on 6/6/2001, P. Weatherbee; Chelmsford power line, 5 on 5/29/1998, B. Cassie; and Petersham Tom Swamp, 4 on 5/29/1999, D. Small et al., recent report 1 on 5/31/2011, F. Model (ph.). It has been fairly frequently reported from Williamstown (e.g. 1 on 5/29/2011, P. Weatherbee). Arctic Skipper is not usually found on NABA Counts due to its early flight period. NOTE TO COLLECTORS: PLEASE REFRAIN FROM COLLECTING SPECIMENS OF THIS SPECIES EXCEPT FOR SCIENTIFIC PURPOSES UNDER INSTITUTIONAL AUSPICES AND WITH LANDOWNER PERMISSION. Arctic Skipper is univoltine, its single flight lasting from the third week of May through June in recent years, according to the MBC flight chart (http://www.naba.org/chapters/nabambc/flight-dates-chart.asp). The Atlas had reported a shorter flight period of “late May to mid-June”, but some MBC flight dates are both earlier and later than that. In addition, the peak flight date seems earlier. The Atlas reported a “peak in the second week of June”, whereas MBC flight data show the most numbers flying in the first week of June. Earliest sightings: In the 22 years of BOM-MBC data 1992-2013, the three earliest "first sightings: are 5/20/2009 Royalston, C. Kamp and A. Mayo; 5/20/1998 Worcester, Broad Meadow Brook, J. Mullen et al. ; and 5/23/2012 Ashburnham, G. Dysart (ph.). The Atlas early date had been 5/27/1986, Sudbury, D. Walton. Latest sightings: In the same 22- year time period, the three latest "last sightings" are 7/11/1992 Central Franklin NABA Count, M. Fairbrother, 6/27/2004 Royalston, C. Kamp, and 6/26/2002 Hubbardston/Rutland Barre Falls Dam, M. Lynch and S. Carroll. The Atlas late date had been 6/26/1988, Otis, E. Dunbar. Comparison with 19th century flight dates is not possible because the species was not recorded here then. The chief threat to Arctic Skipper in Massachusetts is probably climate change (Table 6). Warming may already be resulting in a contraction of its range northward and westward in the state. The species is listed as S3 or “vulnerable” in Massachusetts by NatureServe (2010), and it is near the southern limit of its range here. Further research is needed on the precise host plant use and habitat in Massachusetts. In addition, Arctic Skipper is univoltine, limiting its numbers. We list it here as a Species of Conservation Concern in Massachusetts.